This month's Slow Cooker Spotlight is featuring a hearty potato chowder that's a filling meal-in-a-bowl. Last weekend when I was visiting home, my Dad sent a big bag of gold petite potatoes back to San Antonio with me. I wanted to whip up something special with these potatoes to share with my readers...and I found the perfect inspiration when I also managed to bring my brother's cold back to San Antonio with me! A warm, filling bowl of chunky chowder was just what I was hungry for...so out came my handy Cuisinart 3-in-1 Multicooker to make this Kitchen Sink Potato Chowder. It's chock full of healthy veggies, lean turkey smoked sausage, and cheese. After about 20 minutes of chopping and assembling everything, the Multicooker did the rest of the work for me! Six hours later, Michael and I enjoyed heaping crocks of this hearty chowder for dinner. To add a bit of spice, each bowl of chowder is topped with a generous sprinkling of pepper jack cheese, which can be stirred into the chowder. This chowder was definitely a comforting dinner on a cool, breezy Texas evening. If you don't have any turkey sausage on hand, feel free to substitute diced lean ham...or even some crispy bacon. Any of these will bring a nice smoky flavor to the finished chowder. Step 1: Brown the turkey sausage in a medium skillet. [Note: my Cuisinart multicooker has a non-stick insert and a cook function that allows me to do this step right in the multicooker's insert.] Turn the slow cooker to the Low setting. Add the sausage, carrot, onion, and garlic to the slow cooker and stir to combine. Season with salt & pepper to taste. Then, add the potatoes, corn, and celery to the sausage-veggie mixture. Stir to combine all of the ingredients in the slow cooker. Step 2: Add the chicken stock, bay leaves, and thyme sprigs to the slow cooker. Cover and cook on Low for 6 hours, until the potatoes are tender. After 6 hours, remove the lid and give the chowder a stir. Add the half-and-half and cheddar, and stir until the cheese melts. Taste and adjust salt & pepper if necessary. Let the chowder simmer, uncovered, for 30 minutes. This allows the flavors to combine and the chowder to thicken. Step 3: To serve, ladle the chowder into bowls or soup crocks. If desired, top with more cheese. 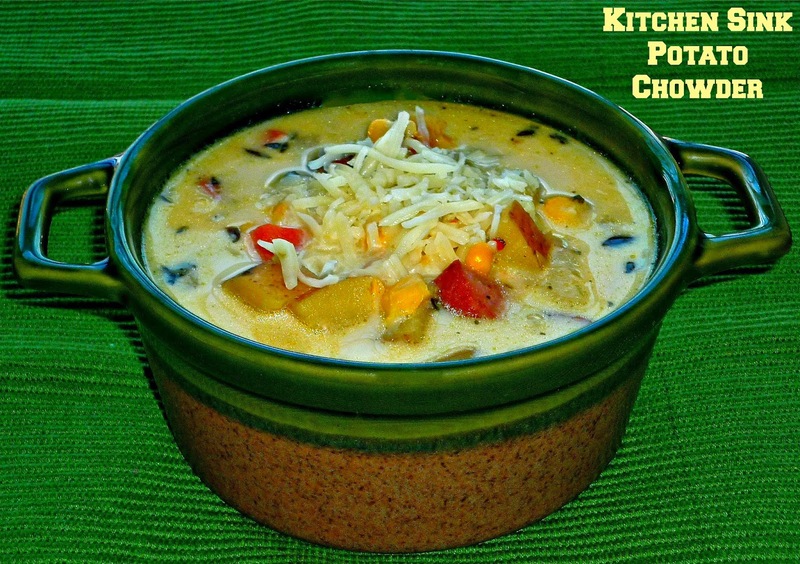 I wanted my chowder to have a bit of spice, so I topped each bowl with pepper jack cheese. Then, I stirred the cheese into the soup and let it melt before eating. It provided a gentle spicy kick! We really enjoyed this chowder! It's creamy, cheesy, a little spicy...and totally filling. Each bite features chunks of potato, smoky turkey sausage, and sweet corn. The long, slow simmer in the slow cooker allowed the flavors to combine very nicely. Since there's just two of us at Casa Garcia, I even had enough chowder left for dinner one night this week. That's a nice bonus for sure! 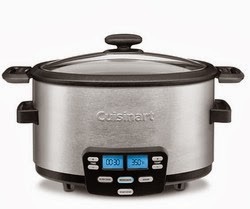 Disclosure: Cuisinart provided me with a 3-in-1 Multicooker for my monthly slow cooker featured recipe.